What will it be like at U.S. Bank Stadium on Super Bowl Sunday? Loud. Electrifying. A once-in-a-lifetime experience. For the die-hard or casual football fan, to be one of the fortunate 66,669 with a ticket, this is the pinnacle of sport: part spectacle, part celebration, topped off with a confetti explosion and the awarding of the Vince Lombardi Trophy—all rolled into one. It’s the best party on earth—and we considered every detail when we designed this magnificent place. As sports and entertainment designers, we are the ambassadors of the fan experience. We think about the entire arc of engagement, starting from the minute a fan leaves home—because that is what our industry is competing with: a cozy couch, a great flat-screen TV, and a fridge within arm’s reach. I come from a very sports-centric family. Growing up in New Jersey, then later in St. Louis, we attended a high school, collegiate or professional games several times a week. If we weren’t experiencing a game live, we were in our living room watching on TV. Over the years, I was lucky enough to attend three World Series games in St. Louis—a great sports town, and an architectural gem of a city. The city certainly played a role in my design interest, no doubt. Also from childhood: there was church on Sunday, and in the fall, football always followed church—it was our second religion. I have indelible memories of family, and sports were the connective tissue. As an interior designer who has personally experienced the powerful role that sports play in people’s lives, I know the ability it has in bringing people together. Every day, I have the enviable pleasure of working with a team of 25 of the most talented interior designers working in the industry today. We’re intensely focused on inventing new experiences that people haven’t yet had at a live sporting event—immersive, transcendent moments you’ll never have on your living room sofa. 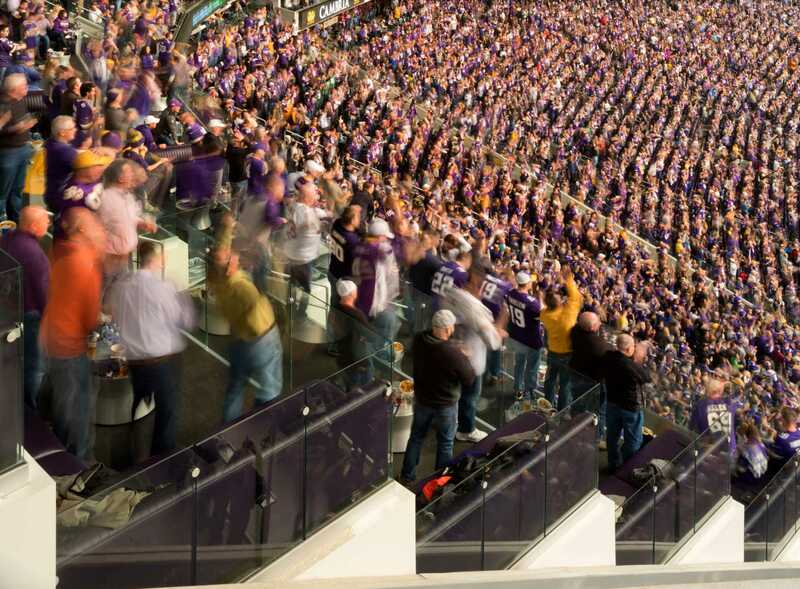 One look inside U.S. Bank Stadium tells the story more specifically. At Mystic Lakes Club Purple, one of my favorite club spaces inside the venue, fans sit at a fire pit, outside, on a balcony with Minneapolis skyline views, or taking in every play of the game while enjoying VIP table-side service. That’s just one of six bespoke club experiences awaiting fans attending the big game. The space features three unique seating types: the NFL’s first lounge sofas, loge boxes and club seating. Who wouldn’t want to sit on a sofa in your own lounge, big screen in front of you, field below, and wait staff to attend to your every need so you don’t miss a moment of the action? Its nightclub-like atmosphere feels exclusive, yet it is one of the most affordable Club Level seats in US Bank Stadium. You’ll also be able to stand on the turf, yet remain inside your own private box, replete with a kitchen with a free-standing island reminiscent of something you would see in one of new luxury urban loft redevelopments near downtown. The catch? In this instance, your back deck—a field box concept on the playing surface, just 25 feet from the sideline—giving fans the (hyper-real) feeling that the Super Bowl just happens to be unfolding in their backyard. In the era of virtual reality, a pair of VR goggles just can’t compete. 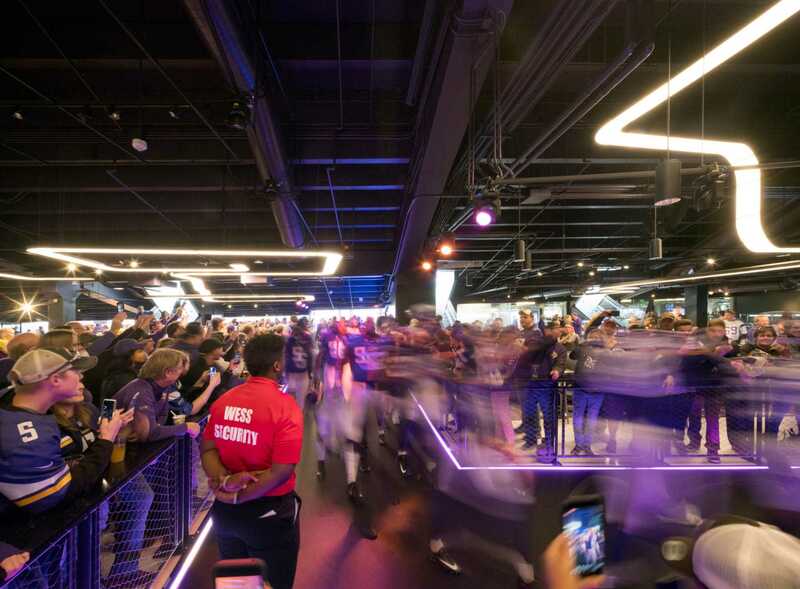 And speaking of technology and the fan experience, U.S. Bank Stadium is one of the most sophisticated in the world when it comes to Wi-Fi access. No fan will be iced out trying to log in and share a Super Bowl memory on their social sites. The venue’s technology infrastructure ($60 million of the stadium’s budget) includes 1,300 Wi-Fi access points, installed in the bowl’s hand rails, under seats and across support beams throughout the stadium. 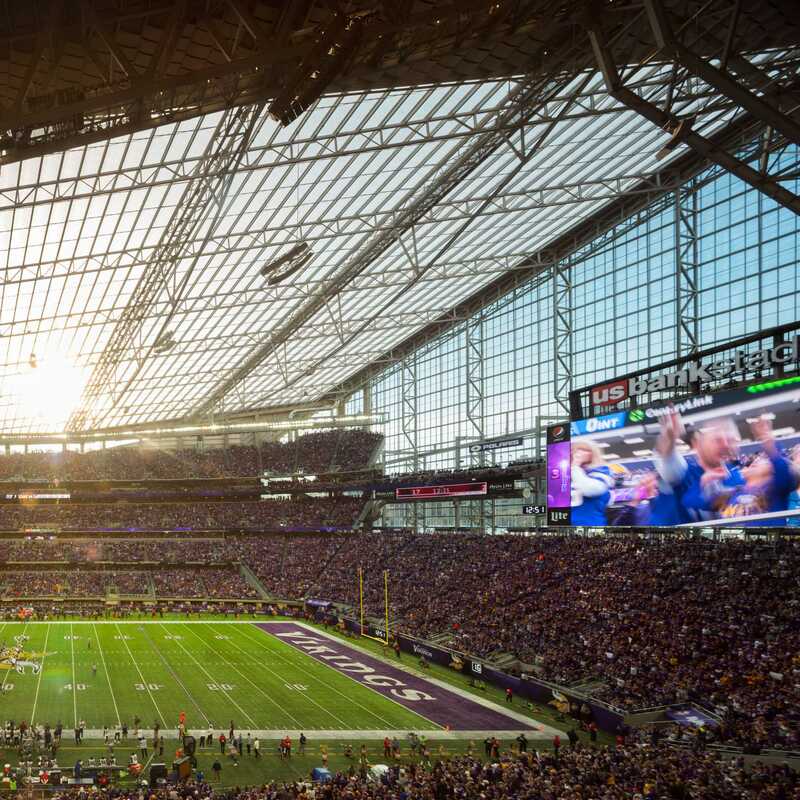 This proprietary technology ensures prime frequency and coverage throughout the venue, and recent upgrades included the installation of hundreds of “smart cells” on utility poles throughout Minneapolis, so even fans walking to the stadium or watching the game from a packed restaurant or bar will stay connected. Another incredible in-stadium feature is the U.S. Bank Stadium Art Collection, paid for by the Minnesota Vikings. The collection showcases the work of about 40 Minnesota artists who were selected from more than 1,100 submissions. The artists contributed 200 original pieces of work, 400 photographs and 1,500 square feet of wall graphics that span eight mediums and three different themes. Three Vikings player alumni – Matt Blair, Carl Eller and Jim Marshall – were among the artists chosen for the collection. 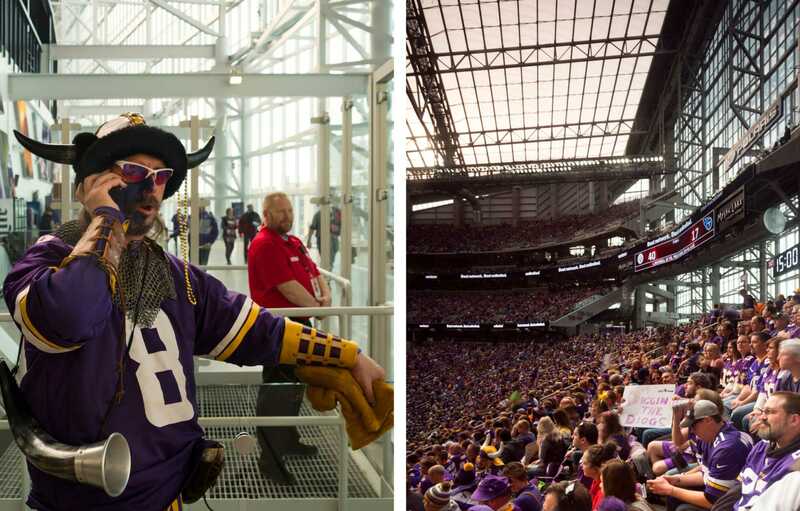 U.S. Bank Stadium, known as “The People’s Stadium,” belongs to its place, unique culture and geography. We took inspiration from the region’s deep Scandinavian roots, and it shows. You’ll never be able to identify what could be termed an “HKS-designed stadium” because they’re all different and appropriate to their locale. We dig deep and do the research, we understand the market, the team, the client and the project’s purpose. Embedding yourself with the locals, observing how they like to spend their time, developing curiosity about the lifestyle of a region, and being present and aware for those moments—design authenticity comes from that place. By applying market-driven data with observational research, we arrive at design solutions based in fact, not just belief. 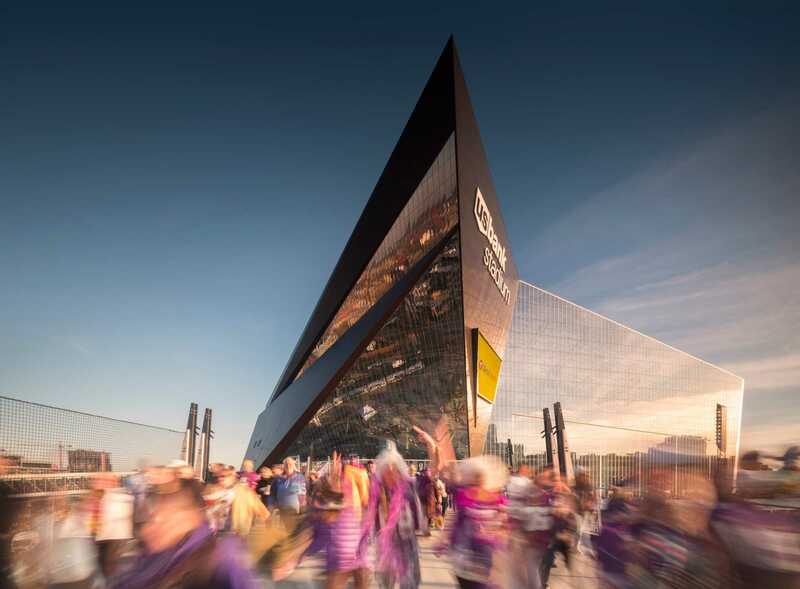 There’s a new hybrid concept we explore when creating new venues like U.S. Bank Stadium; we are developing ‘retailtainment’ so-to-say. People like to be entertained by something—space, place, people, circumstances, choices and rewards. It’s that instant gratification or living in the moment where people are entertained in multiple ways, simultaneously that keeps them coming back, time after time. It is not just the physical space—it’s the lighting, the energy and vibe, the way a patron feels about the total experience; the view, the taste, the touch, the sound, the incredible customer service (yes, we are engaged in that delivery, too). All of these are crucial attributes to delivering a well-orchestrated, deeply immersive, experiential environment. We have no control over the performance on the field, and sometimes it can be less than stellar. But we can confidently say that by creating the scene and delivering an exceptional atmosphere, you will leave describing an amazing day that felt custom-designed, just for you — a day that leaves you longing to return. As Super Bowl LII rapidly approaches, all eyes are trained on Minneapolis. The Twin Cities, like all good civic hosts when the world lands on your doorstep, is prepared. 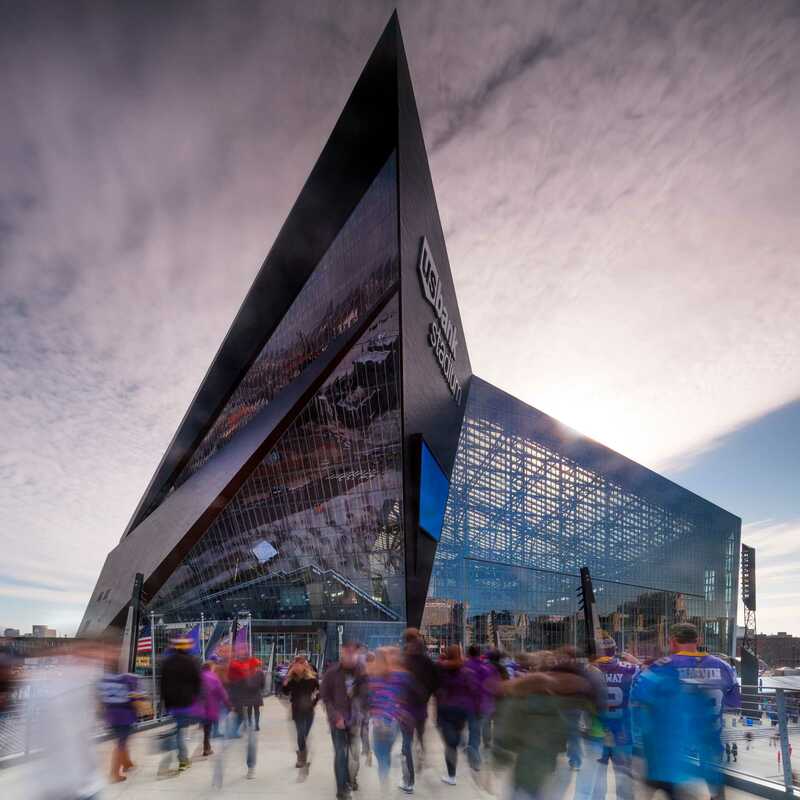 When U.S. Bank Stadium hosts its first Super Bowl, fans attending the game and the millions watching around the world will be struck by the stadium’s bold and modern shape, yet unaware of its underlying design strategies, technology integration and advanced building materials science. 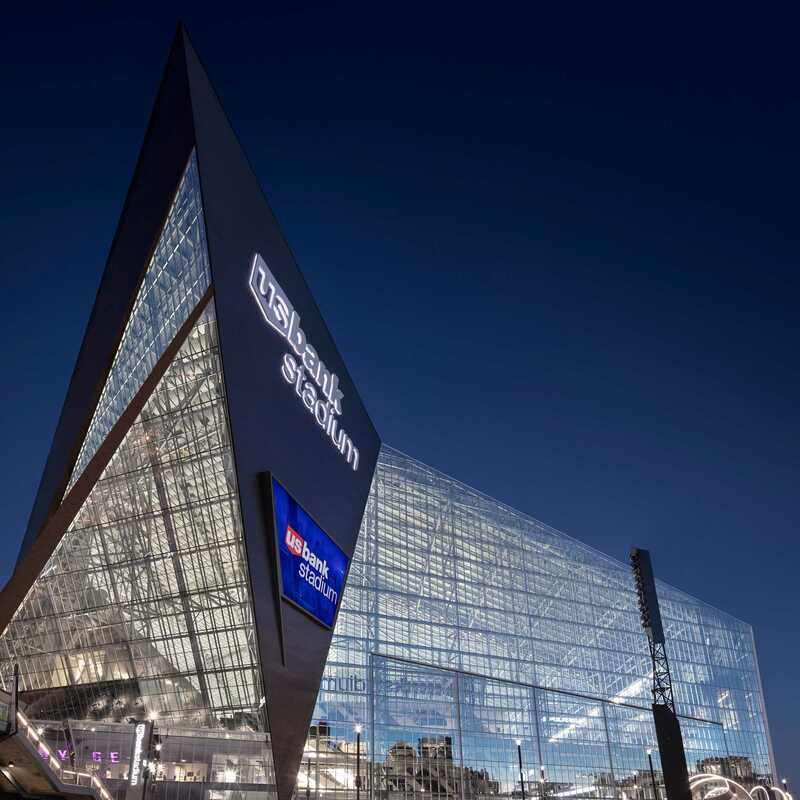 It’s a dream come true to be part of the team that designed U.S. Bank Stadium, host to this year’s Super Bowl LII in Minneapolis. With more than 30 years of experience, Loretta has developed a reputation for creating stadium interiors that elevate the fan experience. As an interior designer, her work seeks to evoke the spirit of her clients, their brand and the fans.